If you have been following me on Twitter and Facebook (and if you aren’t, what are you waiting for?! 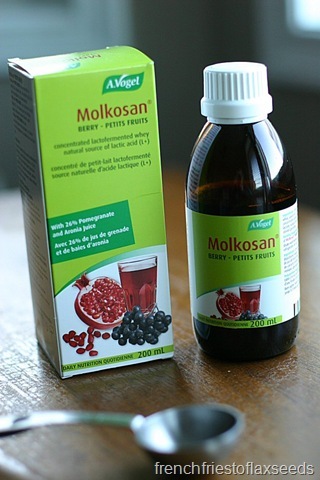 ), you may have noticed that I have been talking about something called Molkosan Berry. You may have even seen a photo or two! 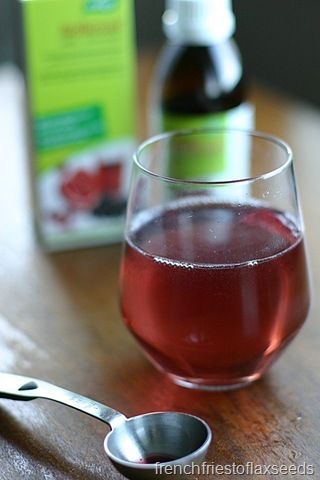 During the month of November, I was participating in a 21 day challenge with A.Vogel, which involved taking the Molkosan Berry Tonic every day. What is this Molkosan Berry Tonic you may be asking? It is a concentrated lacto-fermented whey product, rich in L+ lactic acid, and flavoured with pomegranate and aronia (or chokeberry). It is meant to stimulate the stomach by restoring it’s natural acid pH, which in turn should aid in digestion. It is also a source of potassium (7% of your daily value), and calcium (8% of your daily value). I’m always interested in things that have to do with our guts, so being curious, I wanted to give it a go. 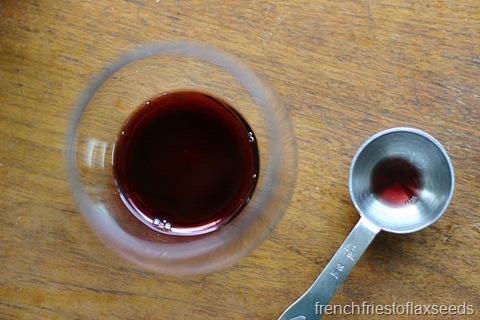 The tonic was a deep ruby colour, and had a really familiar and nice taste. I could never quite put my finger on what it reminded me of though – it didn’t taste like pomegranate juice, and almost had a vanilla quality to it? I checked the ingredients, and there is no vanilla to be found, so I don’t really know what made me think vanilla. Regardless, I was glad it had a good taste, because it’s pretty hard to want to take something daily when it isn’t very pleasant. I mixed my daily tablespoon of tonic into a glass of water to start my day, although I did add it to my berry smoothie a couple of days, just for fun. Because it tasted good, it was something I looked forward to every day. But enough about the taste right? Did it actually do anything digestion wise is the question we all want the answer to. Here’s the thing – I’m not really sure. I can’t say I noticed any difference in the number of times I felt bloated or gassy, or a true change in my, uh, voiding habits. I’ve really thought about it throughout the challenge, but I just can’t say I noticed anything changing because of this. Does it mean my gut isn’t happier because of it? Not necessarily. But it just didn’t manifest itself in a way I could notice on a day to day basis. Maybe I just eat too many fermented foods already anyways. Who knows? Overall, I’m not entirely sure about the Molkosan Berry Tonic and it’s health claims. I always think your go to for gut health should be food first, because what we eat has such an impact on how our digestive system behaves. But again, this is only my experience, and I can’t speak for everyone. Would I rush out to buy it? Probably not. But it was fun to give it a go, that’s for sure! Thanks A.Vogel for the opportunity!